This past week, I had the amazing opportunity to work with an exciting group of elementary teacher leaders (lead learners if you will) from across our state. Over the course of the four days, we engaged in mathematics, discussed classroom pedagogy, and reflected on our practice while centering around the big idea of Developing Procedural Fluency through Conceptual Understanding. While I am still trying to digest all of the conversations, I thought it may be helpful to start with this initial list of thoughts and then expand on each at later times (immediate deep reflection is just not my forte;). Virginia Bastable spoke around the topic of “Supporting Mathematical Reasoning Across Grade Levels: Helping Students Make Connections Between Arithmetic and Algebra.” She spoke, showed video and guided us through student learning in relation to developing algebraic reasoning in the classroom. She was amazing and left me with some things to really think about in terms of my teaching. I, of course, tweeted some things that really struck a chord during her talk.. I particularly love the slide above due to the wording. The thought of regularity in their reasoning, not simply saying “patterns.” With regularity, comes irregularity in which I find intrigues students (and most adults) to dive deeper into the relationships of the mathematics. I love the feel of that so much better than “why doesn’t the pattern work?”…don’t get me wrong I love that question, but “irregularity” hits me a bit differently. I am sure I will be coming back to that as I use that with my students this year! Virginia reinforced my belief that teachers should have explicit goals for each lesson, but that students should not have a specific question/objective that influences their thinking about the work before they engage in the math, ahem…Lesson Essential Question. Goodbye. Thank you. The thought of vocabulary as a gift to explain reasoning is huge. In ELA, teachers are told not to front load vocabulary before reading a passage/story, students should learn it in context. So, why do so teachers not think the same thing applies in mathematics? 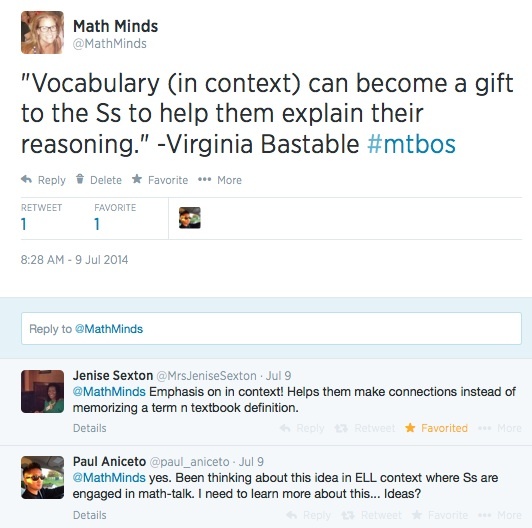 Virginia was dead on…in context, give the students the math words to use to make their reasoning easier to explain. Outside of Virgina’s talk, we did so much math around conceptual building of procedures that I cannot even list it all, however I did have some things come to mind regarding the math in every part of every day….the importance of equivalencies in ALL number work, how critical decomposition of number is in all facets of number work, how our work with Number Talks is invaluable in students explaining their reasoning and creating arguments, and how much geometry and measurement is embedded in our number work. All of these could really be (and hopefully WILL be) their own separate blog post! When talking to the teachers, I noticed how much they appreciate learning the trajectory of the math and the seeing connections from what they do immediately in their classroom to where their students “start” or “end up” with the conceptual building. I think sometimes teachers do not see how critical it is for students to be flexible in making tens in Kindergarten because in the future those same students will rely on that understanding with decimals, fractions, equations and so on…..If a student understands why 3 + 7 = 10, they can reason that .3 + .7 = 1, 3 pieces the size of 1/8 (3/8) + 7 pieces the size of 1/8 (7/8) = 1, 3x + 7x = 10x (no matter what the x)….could go on and on….and this could all start with a 10 frame. Amazing. Personally, as one of the presenters, I realized how much I LOVE hearing my students talk about math. I used some of their work samples & video in the presentation. I truly forget how awesome they are. We all get caught up in the school year craziness and forget to really listen, so it was nice to reflect back on that over the summer. They were comfortable making mistakes, talking to one another, and really worked hard on understanding the math. Made me proud to say I taught them. I encourage everyone to do it. Also in the presenter role, I realized the connections between planning for adults in comparison to planning for my students. There must be an entry point for everyone, there must be an explicit goals, present ideas,not topics, working cooperatively in groups is so important, personal reflection is necessary, active engagement is necessary…..sooo many…. Lastly (for now), I am so excited to be working with such a dedicated and passionate group of educators who care as deeply as I do about impacting math instruction across our state. They remind me each day that every teacher is at a particular point in their journey, that continuous learning is so important, that my passion for what I do is exciting (because I do get a bit high strung sometimes …heehee), that change takes time (again, very hard for me to grasp:), and that we are a team. I love it. I have so many more things to reflect upon, but in the hopes of getting something else productive done today, I must stop here. I will leave you with some bumper stickers created by the participants at the end of the final day encapsulating their experiences over the course of the week…. 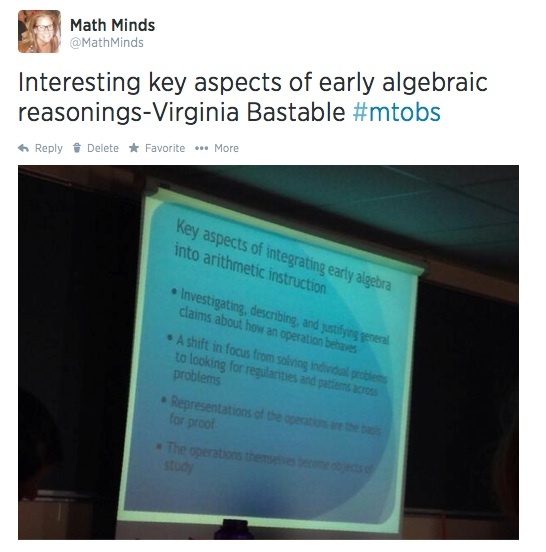 This entry was posted in Uncategorized and tagged mathematics, students, Virginia on July 12, 2014 by mathmindsblog. I love conceptual math! It really clarifies thinking processes in math. 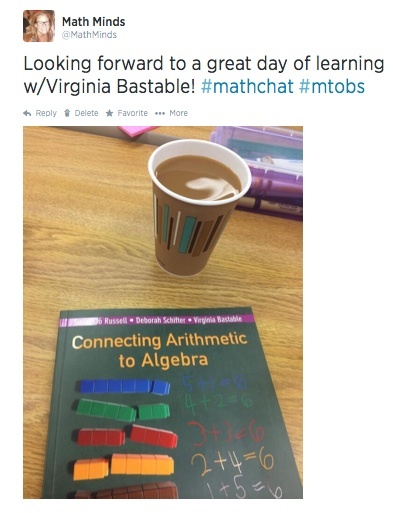 It’s great to hear how much you enjoyed your math inservice. If you haven’t checked out much Marilyn Burns, be sure to look into her stuff. I think I have most of her books and fortunate enough to attend one of her hands-on presentations. Get her About Teaching Mathematics book. It’s costly, but worth it. The other person I’d HIGHLY recommend is Jo Boaler. Shes just starting her YouCubed.org site and again, was fortunate enough to sign up for 2 of her online courses through Stanford. HUGE conceptual learnings! I’ll be sure to check out more about Virginia Bastable. Thanks for the insights! Thank you! I have been fortunate to meet Jo in Delaware, read her books and take her course online! Love her work! We also use Marilyn Burns Do The Math program for our RTI classes. Great stuff! !